In CAOS, Creativity and Alameda’s Orchestra Studies, our goal is to develop creativity as an essential pillar in our students’ learning processes. CAOS branches out on three art fundamentals: music, visual arts and theatre. 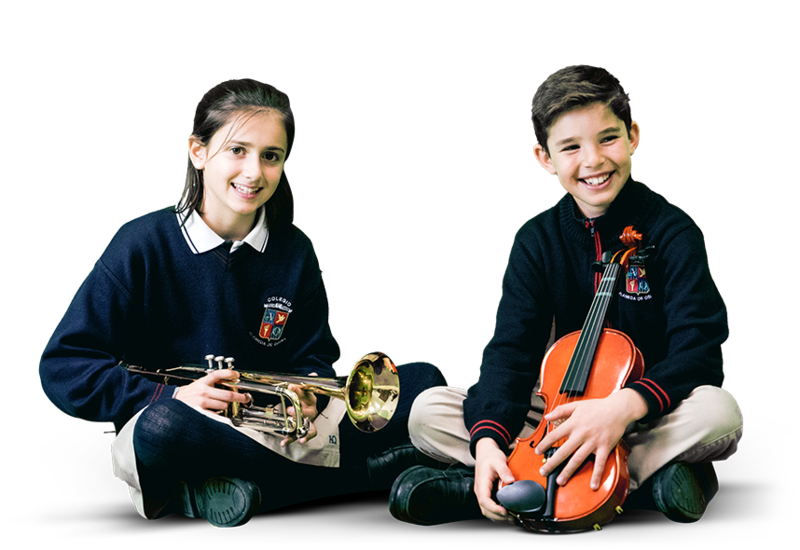 These three subjects join in creating a common project which in its final stages becomes a MUSICAL PRODUCTION and they become specific artistic areas: orchestra, scenography and acting. In this subject, we develop specialized musical training in which a symphonic orchestra instrument is learned. Alameda’s Orchestra is made up of string and wind instruments such as the violin, viola, violoncello, clarinet, saxophone, trumpet and trombone, which are all part of the musical production’s musical area. Training ends with the musical-theatrical production in which Alameda’s Orchestra gives its students a similar experience to real-world productions. Our Arts subject develops creativity through artistic expression by learning different visual and plastic techniques. Training ends with complete scenography creation for the musical-theatrical production in which the CAOS project culminates. Our Theatre subject contributes to linguistic and social development as well as rhetoric. It strengthens our students’ self-esteem and body expression through a variety of acting techniques. These techniques are put into practice in the musical-theatrical productions which is created alongside the other two subjects, where students embody different characters, individually and collectively. CAOS is a unique opportunity to fully understand education, offering the possibility to apply different and innovative methodologies that allow for the integral visualization of art. What is most important though, is connecting emotions through artistic expression.